I often receive emails from people asking for recipes. For desserts, the most frequent request is for "anything lemon". For entrees, the most frequent request, believe it or not, is for Indian recipes. I'll be the first to tell you I have limited experience with Indian Cuisine, so I needed to enlist the help of someone who knows what she's doing, my high school classmate, Kathleen. She once told me she loves Indian Cuisine so much that she feels like she must have been an Indian woman in a previous life! She suggested watching Bal Arneson on Spice Goddess. OMG Her recipes look AMAZING!! Thanx Kath! So this recipe is the first one I decided to try. It's quick, easy, and delicious!! It's really quite wonderful. On one hand, you have spices that are warm and aromatic, and on the other hand you have the cool creaminess of the yogurt. It's perfectly balanced! When I first made it, I stored the leftover chicken mixture in the fridge for a day or two. Then I had it for dinner again, and it was SO MUCH BETTER the second time around! The flavors got a chance to really marry together and the spices became sort of mellow and smooth. SO good. I HIGHLY recommend making it the night before you plan on serving it. You could even make it ahead and serve it at your next party! Place the oil in a large skillet over medium-high heat and add the onion, garlic and ginger. Saute until the onion is soft and golden, about 4 minutes. Add the coriander seeds, garam masala, paprika, turmeric, and salt and toast for 15 seconds and then add the tomato paste, stirring well to incorporate it. Add the chicken pieces and stir well to coat them the spice mixture and cook until the chicken is almost cooked through, about 8 minutes. Add the yogurt and continue to cook until the chicken is done, about 2 minutes. Place a tortilla on a baking sheet and then cover the surface with some filling. Sprinkle on a third of the cheese and then place another tortilla on top and press it down gently. Brush the top with a bit of oil and then repeat with the remaining tortillas, until 3 quesadillas are assembled. You may need multiple baking sheets. Bake the quesadillas in the preheated oven for about 8 to 10 minutes, or until the cheese is melted and the tortilla is slightly golden. 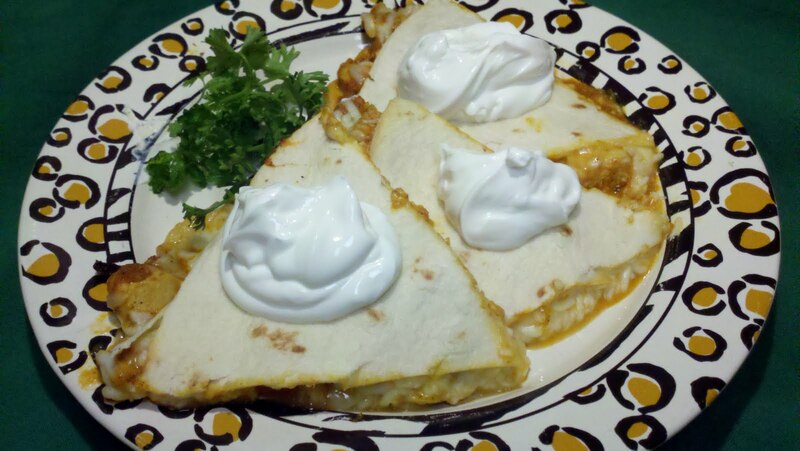 Cut the quesadilla into wedges and serve. As pictured, I like to serve them with a huge dollop of sour cream. YUM! If it's too hot out to turn on the oven, or if you just prefer cooking outdoors, take a tip from our good friend and culinary master, Joe LaGrossa... just cook it on the grill! You can assemble the quesadillas as you normally would, and then slide them onto the grill, (preferably not on the hottest portion). Close the lid for just a few minutes until the cheese is melted, then serve as usual! Thanx Joe!